Greg Everson just had to record this out, just like his team had recorded the previous 59 outs. This was the bottom of the 20th inning in this September 1990 contest, a pivotal playoff contest. Everson threw a strike, ringing up the hitter and advancing the O-Royals closer to the AAA championship. Everson threw that strike at the end of his fourth season as a pro. He would get just one more. He would also never make the majors. Everson's pro career began in 1987, signed by the Tigers as an undrafted free agent out of the University of Michigan. With the Tigers, Everson started at rookie Bristol, getting 12 relief outings, with a 1.61 ERA. He moved to single-A Lakeland for 1988, putting in 53 outings, with a sterling 2.02 ERA. He also saved 17. For 1989, Everson hit AA London. There, he got into 47 games, posting a 2.94 mark. Everson also caught the eye of the Royals, who traded veteran Jerry Don Gleaton for the prospect in spring 1990. "Everson is a sidearm, burly Dan Quisenberry type," Royals VP for player personnel told The Associated Press after the trade. "He's a pitcher who will battle all the way, and who wants the ball." With the Royals in 1990, Everson started at AA Memphis, getting 24 outings there. He then moved to Omaha, getting another 33 outings there. Between them, he posted a 2.38 ERA. 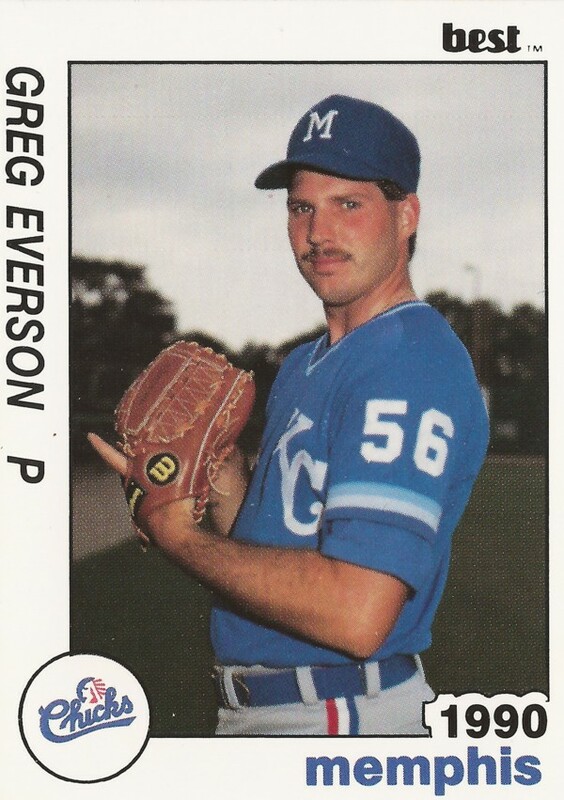 For 1991, Everson started back at Omaha, but he pitched in just 16 contests, with an ERA of 4.88. Soon, he was in the Brewers system, getting seven outings at AA El Paso. His 1991 campaign was then rounded out by another seven outings at independent high-A Reno, ending his career short of the majors.